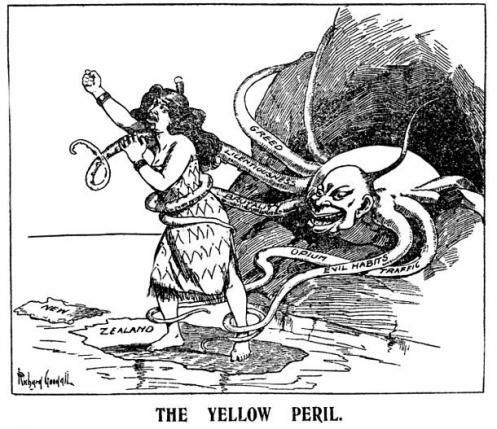 Anti-Asian racism – such as this ‘Truth’ cartoon from 1907 – disfigured much of the twentieth-century labour movement. Let’s not let it infect the twenty-first’s. You’d be forgiven if you thought these quotes are from a National Front website. Building a bridge for a coming race war? Foreigners out? New Zealand for the New Zealanders? This has the same tone and paranoia of the Yellow Peril rhetoric that comes out of the racist Right. These quotes are actually from veteran activist John Minto and union-funded blogger Martyn Bradbury. Far from attacking Labour’s race-baiting of Chinese foreigners based on shonky statistics, they’re both in agreement with this anti-Chinese, anti-foreigner rhetoric.